Each year, I set goals for my photographer self. In 2011, my goal was to get some pictures of hummingbirds. You can see the results in the post Hum Along with Me from that fall. In 2012, I set two goals. 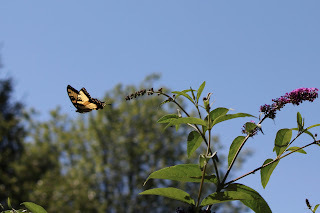 The first was to stretch my hummingbird goal--and get some photos of them flying; most specifically, I was trying to get a hummingbird, in flight, but not at a feeder. 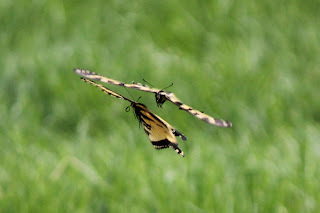 And the second goal was to photograph a butterfly in the air. 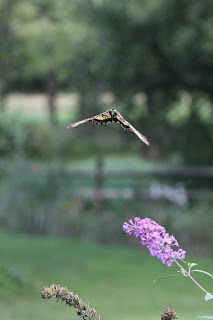 I did manage to get some great hummer photos; I'll share them in a future post. 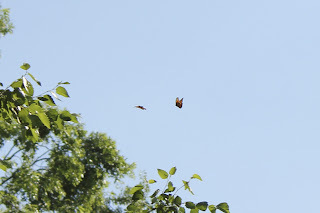 In the end, they were rather easy--at least compared to trying to capture butterflies in flight. 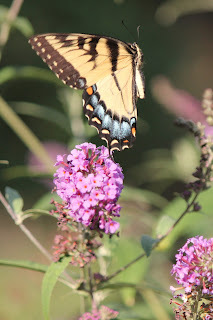 In attempting to perform this elusive feat, I learned a little bit about butterfly photography. First of all, the little buggers are skittish, particularly when large shadowy things move nearby. That's easy to understand; large shadowy things (think birds) eat butterflies. And from a butterfly's perspective, if you're a human, you are a large shadowy thing--and you might as well be a predator. They're not going to stop and ponder the situation. So you have to move slowly around them, or they flitter away. 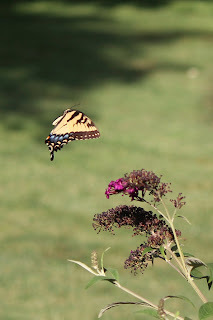 Of course, if you're trying to catch a butterfly on the wing, flittering away ain't such a bad thing. Except butterflies are also quite small, and therefore hard to see through the camera viewfinder. So you need a telephoto lens. But if you ever watch how a butterfly actually flies, you'll epitomize the word "erratic." No straight lines here. Nothing like the cooperative hummingbirds who sometimes hover in place and allow you to focus for a half second. Butterfly flight is more like...well, you know when you play pinball and your ball gets into that magical part of the machine where it pings around and back and forth and up and down, bouncing on bands and walls and lights and bars? And you rack up all kinds of crazy points? That's kind of like it, except that butterflies do it in three dimensions. And you don't get any points. 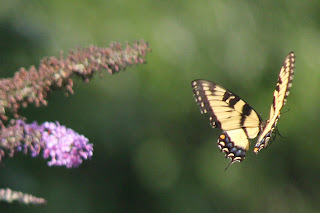 This explains why my first attempts resulted in blurry blobs of unrecognizable butterfly. 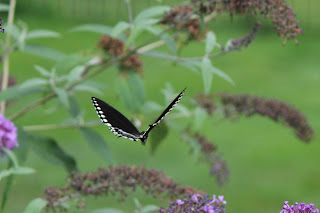 Either I couldn't focus fast enough, or the spot auto focus was in the wrong place, or I was trying to move the camera to follow the butterfly--and failed completely. Two Monarchs, too far away. Well, at least some of the flowers were in focus. Autofocus thought I was taking pictures of Lilah. 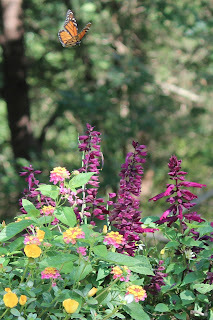 The butterfly is that yellow blur on the lower right part of the picture. Trying to follow the erratic flight path of a butterfly isn't easy. I eventually figured out that the best way to attempt to capture a flying butterfly on (virtual) film, was not to try and follow it as it flew, but instead to focus on an imaginary plane where I thought a butterfly would fly, set the lens at a wider angle, and when one of those flittery creatures flew in the general direction, just start snapping away. My pictures improved a bit, but my subjects were still often slightly out of focus. 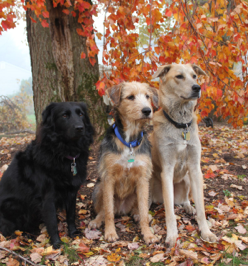 Or they didn't cooperate by staying in the frame. 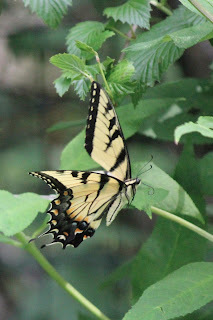 But then, as I started getting better photos, I began to really see how butterfly wings work. And they don't just flap nicely, in concert. There are four parts to their wings, and they move differently. 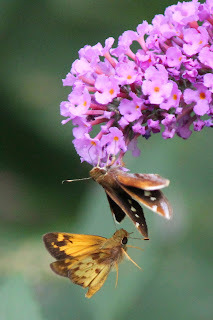 So I might have a butterfly in focus, but the moment I captured shows some really awkward wing positions. 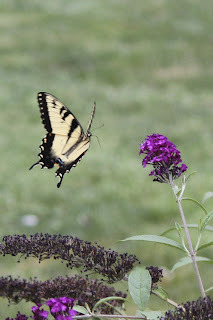 This Eastern Swallowtail was heading toward the flower, with its wings flapping forward. Another one caught on the down flap. And sometimes I would capture the creatures at odd angles, such as flying straight toward me. 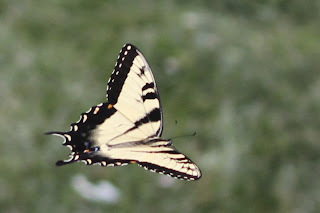 Flying away from me, this swallowtail makes a lovely V shape, but it doesn't make a great picture. 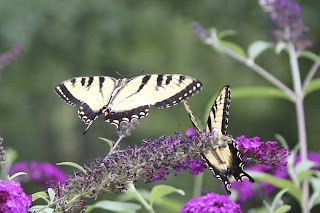 Two Swallowtails could have been really cool, but they're at a very strange angle. This Monarch looks like it was poorly photoshopped into the picture. I also realized that a picture of a butterfly out of context, that is, away from it's food source of pretty flowers, looks kind of lonely. This Monarch is just a little too far from the butterfly bush, but if I cropped out the butterfly bush flowers, the picture would be boring. 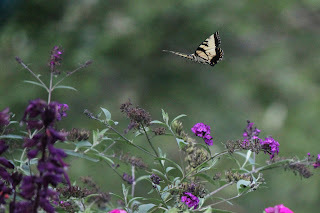 And I discovered that a picture of a butterfly flying away from flowers didn't tell the right story. Don't like what's on the menu? The nectar must be better at another establishment. And then I realized that when you try to take a picture of a butterfly near flowers, you can't really tell that it's flying. 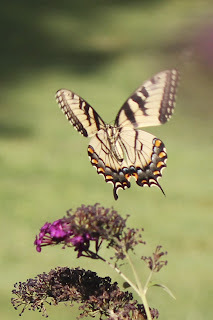 Many of the pictures of butterflies flying that are in focus look like they aren't flying, but have landed on a flower. Two butterflies: awesome! But you can't really tell that the guy on the left is flying, and hadn't landed yet. The Firey Skipper on the bottom is flying upwards, but because there is a second skipper, it's hard to tell what's happening here. And sometimes, flowers, leaves or branches get in the way at the wrong time. The blur over the top right part of the picture is from a blossom that was in the way, but very close to me. And of course, as in any photo, sometimes the composition is off, or the lighting isn't quite right. In the end, I came close, but didn't really get that perfect shot. I know I took hundreds of pictures, probably more like thousands. There are a few that I like, but I never took one that made me say, "Ah, that's what I was looking for." A tiny fraction of the photos downloaded to my laptop. There's always next summer. Until then, these will have to do. 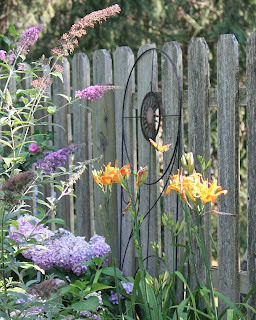 This is pretty, but the Monarch is just a little too far away from the flowers. This American Lady is just a little out of focus. 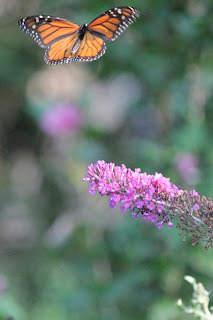 This is one of my favorites, although the butterfly isn't really in focus. It looks like one of the lilies escaped. The silhouette makes an interesting picture, but I want a photo with more color. Another one of my favorites; my Facebook friends will recognize this from my page. 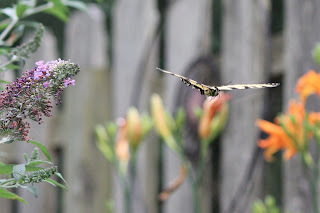 Even though the butterfly is out of focus, it captures a nice moment.